- You need to be walking fit and prepared if you want to make it to the top. 5-10 hours depending on day and your pace (the slower the better). Always be prepared for wet days and cold nights at any time of year! Plan to summit at full moon if you can! The porters will carry max 16Kg per person in a backpack (NO duffel bags). 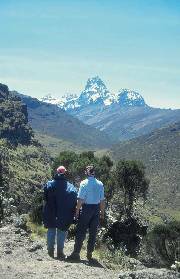 Mt Kenya - the second highest mountain in Africa at 5 199 metres - crowns one of the world's highest National Parks. A spectacularly beautiful area of moorland, forest, lakes, rock and ice, it is a must for lovers of high altitude trekking. The lower slopes are covered with natural forest - home to elephant, buffalo, various monkey species and birds. As one gets higher, the vegetation changes to heath moorland, covered with giant groundsels and lobelia, until the altitude and cold allow only lichens to survive. The twin peaks of Batian and Nelion can only be climbed by serious/trained climbers - a 700-metre rock face and the cold and altitude makes this a hard task. The next peak - Point Lenana - is accessible to hikers. One passes the Lewis Glacier en route to Lenana - beautiful ice caves and wind blasted ice formations provide stunning photographic opportunities. On a clear day, one can see Mt Kilimanjaro from the top. Comparisons to Kilimanjaro are common. Both have their good points - being lower, Mt Kenya should be easier - it isn't !!! There are some pretty steep ascents and quite a lot of scree - it is also very cold. Altitude sickness is more common on Mt Kenya than on Kilimanjaro, due to the fact that the " Tourist Route " ( Naro Moru Route ) provides a quick way up the mountain, and a lot of people ascend too quickly. This route is NOT recommended - except for descent - as it is not scenic and very over-utilised. The " huts " on Mt Kenya are disgusting - old, dirty, surrounded by rubbish and badly run - they should only be used in emergencies. The less utilised routes are, however, very beautiful with incredible views of the surrounding plains and small lakes, as well as the immense peaks of Batian and Nelion. The route is run as a camping trip - with all equipment supplied. Top quality mountain tents, 20mm high density foam mattresses, camp stools, mess tent, good food and a cook, and qualified guides are supplied, as well as a porter for your pack. Groups are limited to 9 persons per guide. The " up " route (Sirimon) is accessible all year round - in the dry season (approx. 15 January - 15 March, 15 July - 15 September) we will descend through the Chogoria Route, which is one of the most scenic parts of the mountain. Being on the wetter eastern side of the mountain, Chogoria is wet a lot of the year when other routes are dry. Other times we will descend using the Naro Moru route - see itinerary. Price includes: Airfare Johannesburg - Nairobi - Johannesburg on South African Airways; Transfers; 2 nights Mayfair Court Holiday Inn on a bed and breakfast basis; 5 night Mt Kenya climb inclusive of all meals; Guide/cook; Porters (1 per client); Camping equipment; Park and camp fees. Price excludes: Airport taxes (approx R740pp); visas, health requirements, travel insurance, gratuities, drinks, sleeping bag, all items of a personal nature and any service not specified. Maximum luggage limit 16 kgs per person in rucksacks please - no duffelbags! You will need a Yellow Fever inoculation, this must be done no later than 10 days prior to departure. If you have had any previous history of liver disorders you must consult your physician first. Malaria prophylactics are a must. REMEMBER - Go 'pole pole' (slowly, slowly) up the mountain - this is the surest way to successfully reach the top! TIPPING - We recommend approximately USD 90-100 per climber. Day 1: Depart Johannesburg on South African Airways to Nairobi. On arrival you will be met and transferred to the Mayfair Court Holiday Inn. Overnight on a bed and breakfast basis. Day 2: You will be collected at 08h00 to depart for Sirimon Gate. Lunch time is spent organizing personal climbing equipment for the mountain trek. Picnic lunch at the Sirimon Gate. In the afternoon an easy walk to help acclimatization to your overnight spot in the forest below Judmaier camp, (10 000 feet) in high altitude mountain tents. Afternoon walk in the forest - chance of seeing game and forest birds. Note that all camp equipment is supplied, and you have a porter for your kit BUT the porters will only carry packs - not bags - so your kit must be taken up in a pack. Day 3: Ascend the Sirimon track to Liki North Valley and camp overnight in this beautiful little valley below the subsidiary peaks of Tereri and Sendeyo (13 000 feet). Day 4: Climb out of the North Valley and into the Mackinder Valley, one of the broadest valleys on the mountain, with many giant groundsels. Camp at the head of the Mackinder Valley, just below the main peaks of Batian and Nelion (14 000 feet). Day 5: Alpine ascent of the third highest peak, Pt. Lenana (16 355 feet). On route up the North face. Four hours of stiff walking on the summit - leave camp at approx. 02h00. Dry Season - descend from Lenana down the Chogoria Route, to overnight near Mintos Hut or Lake Michaelson (12 000 feet). Other times - descend to Teleki Valley on the opposite side of the main peaks to Mackinders camp for a good night's rest (13 900 feet). Day 6: Dry Season - descend from Mintos / Michaelson to Meru Mt Kenya Bandas at (10 000 feet). Overnight here - cold beers, hot showers and fireplaces in the rooms !!! Other times - descend to the Met Station (roadhead) on the Naro Moru track and then back to the Naro Moru River Lodge bandas for lunch, dinner and overnight. The bar at the lodge has momentos from climbs dating back many years, and a fireplace. Day 7: After breakfast depart for Nairobi arriving in the afternoon. Overnight at the Mayfair Court Holiday Inn on a bed and breakfast basis. Day 8: Transfer to the airport for your South African Airways flight back to Johannesburg.